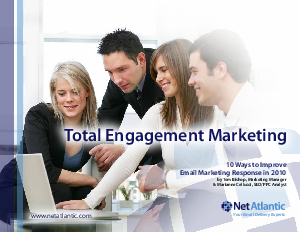 Net Atlantic's "Total Engagement Marketing" e-book covers 10 ways you can improve email marketing response in 2010. Email marketing offers marketers the tools to manage multiple campaigns, create micro-segments, track the entire customer lifecycle, and automate email based on customer behavior. Net Atlantic delivers a vision for the next era of online marketing. Email marketing is the cornerstone of your Total Engagement Strategy. Download "Total Engagement Marketing" today.